Nitrogen (N) is often the most limiting nutrient for optimum corn production. It’s needed in large quantities, but because N is unstable, it can quickly be lost to the environment. In recent years, crop-sensing technologies have been introduced to help fine-tune N management accounting for within-field spatial variability, which can increase yields and/or result in better use of N fertilizer. Technological advances in sidedressing equipment and crop sensors now allow for on-the-go variable rate application of N fertilizer. The proximal sensors (Figure 1) emit light at the visible (VIS) and near infrared (NIR) wavelengths from a light emitting diode (LED), and then they measure the light reflected back to the sensor. 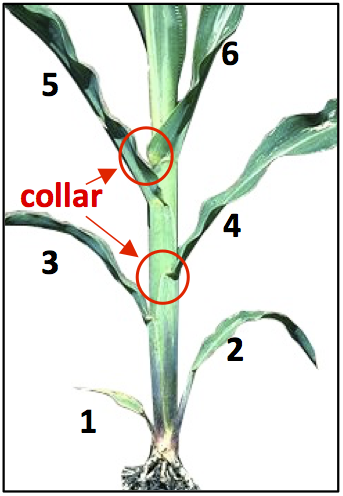 These measurements can be used to calculate various indices as indicators of plant vigor. Figure 1. Handheld sensors displaying the NDVI value reflected by the plant canopy (left) and spray boom-mounted sensors (right). One such index is the normalized difference vegetation index (NDVI), which is an indicator of greenness of the crop canopy and ground coverage. Readings range from zero to 1; values approaching 1 indicate more vigorous plants. Sensors can be handheld or machine-mounted (coupled with sidedress equipment). When properly calibrated, readings are used to estimate yield potential (step 1) and then derive an N recommendation based on expected total N uptake and N use efficiency (step 2). For accurate variable N application, timing of sensing and N sidedressing is very important. Data from field trials in New York in 2015 show that V6 is the earliest possible time to scan for accurate yield potential predictions; at and after V6 the NDVI scan divided by the days from planting, called the In Season Estimate Yield (INSEY) explains more than 60% of the final season yield (R2>0.60; see Table 1). Prior to V6, yield potential predictions based on INSEY are less reliable (R2<0.60 for corn grain at V5 and less than 0.5 for both grain and silage at V4). Scans done at V7, V8 and V9 also have R2values >0.60 but the later scans have two disadvantages: 1) The plants’ yield potential may already be impacted by a lack of N; 2) The INSEY range gets smaller and small scanning differences can have great implications for predictions of both final yield and N needs. Thus, producers should target V6-V8 crop stages for scanning. The plant growth stage is the number of fully emerged leaves that have visible leaf collars (the discolored zone at the base of a leaf blade; Figure 2). The positioning of the NDVI sensor is just as important as the crop stage, and the user’s manual (manufacturer specific) should be strictly followed. Generally, sensors can be held or mounted 24-48 inches directly above the crop canopy centered over the row, but 36 inches is optimum to account for varying height in the field. When applying on-the-go variable rate N mid-season, optimal results are achieved when implementing N reference strips. These are strips in the field that represent N availability extremes (high and low). Reference strips are primarily designed for use in combination with sensor technology (GreenSeeker, CropCircle, OptRX, CropSpec) to calibrate the variable-rate application equipment for a specific field and timing of application. When used with sensors, the strips should be wide enough to cover all sensors mounted on the equipment. The use of reference strips, when implemented properly, can help prevent over-application of N fertilizer by identifying areas where plants have sufficient N or are so compromised in growth due to other reasons that further addition of N is not economical. They can also help prevent under-application of N fertilizer where soil N resources are insufficient and N addition could increase yield. There are four types of reference strips: N-rich, zero-N, ramp calibration and virtual. Additional reference strips may be added in large fields that show high variability. The N-rich strip is where a large amount of N was applied at planting, to ensure no N deficiency mid-season when sidedress N decisions need to be made (Figure 3). The N-rich strips are installed before, at, or directly after planting (ideally within 3 days of planting) to give sufficient time for plants to respond to the N application before it is time to sidedress N. A strip of at least 100 feet long per representative area is typically sufficient.Avoid installing N-rich strips in the headlands, wet areas or any other problematic areas in the field as readings will reflect conditions other than N availability. Avoid installing N-rich strips in the same spot every year as well. Typically it is sufficient to apply twice the N recommended, up to 300 pounds N per acre, in the N-rich strip. The readings of the N-rich strips are used as a base to determine the maximum yield potential of the specific field for that year. This information is needed to calibrate the algorithm, used to prescribe the N rate according to local specifications at the time of application. A zero-N strip is a strip in the field where no N fertilizer is applied at planting and where readings will reflect soil N supply capacity from past manure applications, rotation credits and soil organic matter. It provides an indication of the yield potential if no further N fertilizer addition was done. It is recommended for use in conjunction with the N-rich strip. The RAMP calibration strip is a pass in the field with varying levels of N (at least 5 different rates; at least 40 feet long per rate) applied in addition to the normal starter N application. The main difference in the interpretation between the RAMP and N-rich+zero-N reference strips is that the RAMP strip can give an estimation of the best rate of N to apply when no sensors are used. A RAMP strip may, for example, include 0, 50, 100, 150 and 200 pounds of N per acre. If the corn in the 100, 150 and 200 pounds N per acre sections of the strip look similar and the corn that received 0 and 50 pounds per acre is smaller and less green, the optimum rate is about 100 pounds of N per acre. These types of reference strips can be useful for farmers who do not use sprayer-mounted sensors. Virtual reference strips are “statistical reference strips” that are created from collected data, and not an actual physical N-rich strip in the field. In this approach the “virtual N-rich reading” is created by averaging the readings from the areas of the field that seem greenest and most vigorous while the “virtual zero-N” values are readings from the worst-looking areas. The advantage of this type of reference strip is that it does not require any actual strip implementation in the field. However, its use is not recommended in variable fields because the readings do not account for the actual response of plants to fertilizer. “Virtual readings” are more likely to reflect field variability in topography, texture, compaction, organic matter, etc., rather than variability in N supply and availability. The NDVI is calculated from sensor readings: NDVI = (NIR-VIS) / (NIR+VIS), where VIS is the amount of visible (typically red, green or red-edge) light, and NIR is the amount of near-infrared (NIR) light that is reflected by the plant. 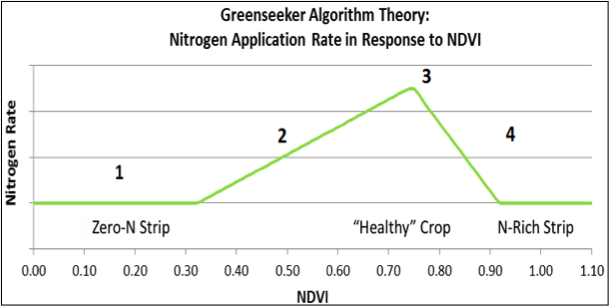 Low NDVI values indicate low crop vigor, and as the values increase it is an indication of higher crop vigor, suggesting that the plant had low or no N deficiency. Sensing of both the zero-N and the N-rich strips gives readings for plants that are potentially N deficient (zero-N strip) and for plants that do not have a shortage of N (N-rich strip). These contrasting treatments provide the best calibration for the algorithms that convert NDVI measurements into on-the-go N rate recommendations. Figure 4. Depiction showing how algorithms convert NDVI values into on-the-go N recommendations. Algorithms have been developed by various universities and commercial companies (for example, Ohio State University, Oklahoma State University, Virginia Tech, Agri-Food Canada) to provide N application recommendations using the NDVI measurements. The sensor determines the NDVI value, and its associated software converts the measurement to an on-the-go N rate using the algorithms. Figure 4 shows how most algorithms work. In this example, low NDVI measurements receive little N because little growth response is expected (poor growth due to reasons other than a lack of N, section 1 in Figure 4). As NDVI values increase through the mid-range, N recommendations also increase because a yield response to extra N is likely (section 2). At point three, yield response to N no longer increases with NDVI. After that point, N recommendations decrease with increasing NDVI (section 4), reflecting sufficient N for optimal crop growth. There are numerous factors that can impact the accuracy of an algorithm, including type and variety of crop, soil type, crop height, local weather conditions and growth stage. To achieve efficient and reliable, sensor-based, on-the-go N recommendations, algorithms that were developed for local soil, field management and climate should be used. With any algorithm, it is important to test the performance within a given area in order to provide growers with the most accurate N rate recommendations. New technologies like NDVI sensors can aid in increasing N-use efficiency through variable-rate N application within an individual field and throughout the farm. Timing of measurement and positioning of sensors are important to achieve reliable results. Furthermore, reference strips are essential to obtain the most accurate, on-the-go, variable-rate N prescriptions. Implementation of N-rich and zero-N strips or RAMP strips in each management zone in a field is recommended. Algorithms convert NDVI measurements into on-the-go N rate recommendations while in the field. Algorithms that are based on local conditions should produce the most accurate results. Variable-rate N application allows growers to reduce N losses to the environment and possibly save on N fertilizers and/or increase yield by increasing N use efficiency. 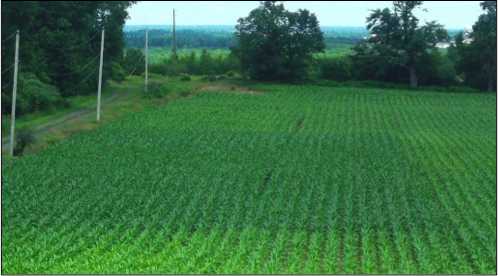 Work is ongoing to evaluate which algorithms are most appropriate to use for corn grown for silage or grain in New York State. Funding was provided by the Northern New York Agriculture Development Program (NNYADP) and the New York Farm Viability Institute. For questions about these results contact Quirine M. Ketterings at 607-255-3061 or qmk2@cornell.edu, and/or visit the Cornell Nutrient Management Spear Program website at http://nmsp.cals.cornell.edu/.